This PDF contains the complete schedule of events at the 2013 Kala Ghoda Arts Festival. 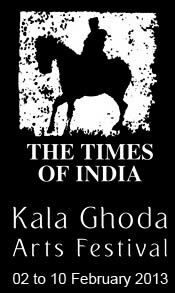 Please click on the PDF to view time, location, dates of all events at Kala Ghoda 2013. In 2013 there are 428 events across 10 categories, at an average of 50 events a day. The day-wise schedule (9 days) of all events and activities at the 2013 Kala Ghoda Festival is listed below. Link to ===> All Events on 2 February, 2013 at the Kala Ghoda Arts Festival. Link to ===> All Events on 3 February, 2013 at the Kala Ghoda Arts Festival. Link to ===> All Events on 4 February, 2013 at the Kala Ghoda Arts Festival. Link to ===> All Events on 5 February, 2013 at the Kala Ghoda Arts Festival. Link to ===> All Events on 6 February, 2013 at the Kala Ghoda Arts Festival. Link to ===> All Events on 7 February, 2013 at the Kala Ghoda Arts Festival. Link to ===> All Events on 8 February, 2013 at the Kala Ghoda Arts Festival. Link to ===> All Events on 9 February, 2013 at the Kala Ghoda Arts Festival. Link to ===> All Events on 10 February, 2013 at the Kala Ghoda Arts Festival. The annual Kala Ghoda Festival takes place in and around the streets of Kala Ghoda (official name “K Dubash Marg”) in South Mumbai. To reach Kala Ghoda, the closest local train stations are Churchgate Station (1 Km) and CST/VT Station (1.6 Km). Please refer to the 2013 Kala Ghoda Art Festival Schedule for details of the venue of the various events. Kala Ghoda Road or K Dubash Marg: Starting from the car park opposite Jehangir Art Gallery to Lions Gate. Most of the 2013 Kala Ghoda Festival Visual Art installations, Street Theater, Dance Performance, NGO Art & Craft Stalls and Food Stands are on this road. The Car Park outside Jehangir Gallery is the center of the Children’s workshops. Rampart Row Amphitheater: Located in the center of K Dubash Marg (aka Kala Ghoda). There are steps on one side of the road where the audience sits and there is a stage set up on the opposite side of the Road. Prince Of Wales Museum: Children’s Workshop at the Kala Ghoda Festival 2013 will be held in the lawns of the Museum (also called “Chhatrapati Shivaji Maharaj Vastu Sangrahlaya”). Children’s workshops will also be held at the car park outside Jehangir Art Gallery. The “Coomaraswamy Hall” at the entrance of the Museum is one of the sites of the Kala Ghoda Film Festival. National Gallery of Modern Art (NGMA): Located opposite Mumbai Museum, the NGMA is the place for the Kala Ghoda Theatre Events and Children’s Workshops. Bombay Natural History Society (BNHS): Next building to the Museum near Lions Gate. The BNHS Hall is the venue for the 2013 Kala Ghoda Film Festival and Quiz. Asiatic Library (Town Hall) Steps: The famous steps of Mumbai’s Town Hall (and Asiatic Library) are the venue for the popular Kala Ghoda Festival Music Concerts. Horniman Circle Garden: The beautiful Horniman Circle Garden is one of the open air venues for the 2013 Kala Ghoda Theater Festival. Cross Maidan: This is the venue of the 2013 Kala Ghoda Dance and Music Festival. Location is outside Churchgate station on the road leading to Flora Fountain. David Sassoon Library: The shaded lawn of the David Sassoon Library is the location for the Kala Ghoda Arts Festival Literature events. (NOTE: Children’s Literature Events will be held at “Kitab Khana” near Flora Fountain). Art Entrance: Located at the entrance of the Army & Navy Building (next to Westside), this is the venue for paintings and visual art. Max Mueller Bhavan: Next building to Jehangir Art Gallery. Max Mueller Bhavan is the host for the 2013 Kala Ghoda Festival Cinema Events and Theatre Plays. Artists’ Centre: Located on the first floor of Ador House on Kala Ghoda Road. It will have paintings and visual art. Royal Oaks Banquet Hall: Kala Ghoda 2013 Food Festival will be held at the Royal Oaks Banquet, located on the Kala Ghoda Street (K Dubash Marg). Kitab Khana: Located on the ground floor of Somaiya Bhavan, near Flora Fountain. the 2013 Kala Ghoda Arts Festival Children’s Literature Festival will be held here. Gallery Beyond: “Gallery Beyond” is an Indian contemporary art gallery located on the first floor of the Great Western Building. It is one of the venues for the 2013 Kala Ghoda Cinema Festival. Hacienda Art Gallery: Located in the Great Western Building. This venue will host Kala Ghoda Festival visual art and paintings. Click on the this link for information and pictures of Kala Ghoda and other venues of the festival. 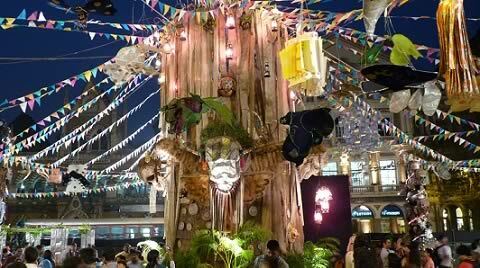 With 428 events, the 2013 Kala Ghoda Arts Festival is the biggest ever festival in its history. In terms of number of events, participants and attendees, the Kala Ghoda Arts Festival is now bigger than most of the world’s famous Art Festivals (“Adelaide Festival of Arts”, “Festival d’Avignon”, etc). Among the world’s leading Arts Festivals, only the Edinburgh Fringe Festival, with 2600+ events, is bigger than the Kala Ghoda Arts Festival. What makes the Kala Ghoda Festival unique, as compared to other world famous festivals, is that it is COMPLETELY FREE FOR ALL VISITORS. If you wish to put up an event in any of the 12 categories at the 2013 Kala Ghoda Arts Festival, please send an email to the respective event coordinator. The 2013 Kala Ghoda Festival in Mumbai has a “Short Film Competition” where the general public can participate. The theme of the competition is “Cinema For Change”. Films (not documentaries), which have a narrative, which are based on the competition theme and which are no longer than 30 minutes can be sent for the competition. For details, please visit the Cinema at KGAF page on Facebook. Kala Ghoda stalls are usually given to people who do not have a retail shop in Mumbai. The management imposes a precondition that those wanting to put up a stall should not exhibit their products for 60 days before the festival. 29 October, 2012 was the last date to submit applications for a stall at Kala Ghoda 2013. A lovely article by a child on her visit to the Kala Ghoda Festival.